Today was not only Anzac day but also the running of the Wellington Ulysses Ambulance Run to raise funds for the Wellington Free Ambulance. So, just a couple of hours after dawn parade, I was on the little red Honda and riding through some very light, misty rain towards Wellington. The rain never really came to much although it was enough to wet the roads and keep things interesting. There was not a lot of traffic on the way down but just before the turn off to Paikok Hill there was a warning sign mentioning an incident on SH1. I didn't think much of this at the time but was glad to get off the main road and into some corners. Arriving early at the meeting point, I had a chat with a few people before hearing some dreadful news. On the way to a Wellington dawn parade an air force Iroquoi had gone down and three of the crew were dead with another in serious condition in hospital. This was the "incident" the sign had been warning me of and a terrible thing to happen on a day of remembrance. Three more servicemen to remember on Anzac Day. More details on the accident here. 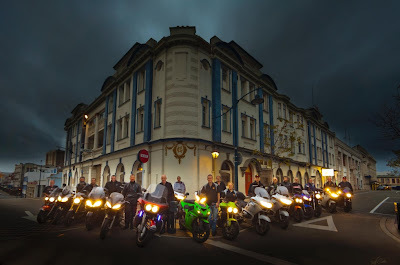 The ride itself was a simple one from Upper Hutt and into the city where we parked near the Free Ambulance HQ, scoffed sausages & coffee and presented the Ambulance service with $1,800. Good stuff. 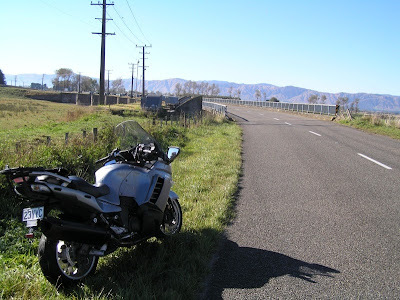 I left pretty quickly and decided to take the long way home by coming back through the Wairarapa. First up was the Rimutaka's and with the roads pretty dry it was a fun run up the hill until I ran into traffic. 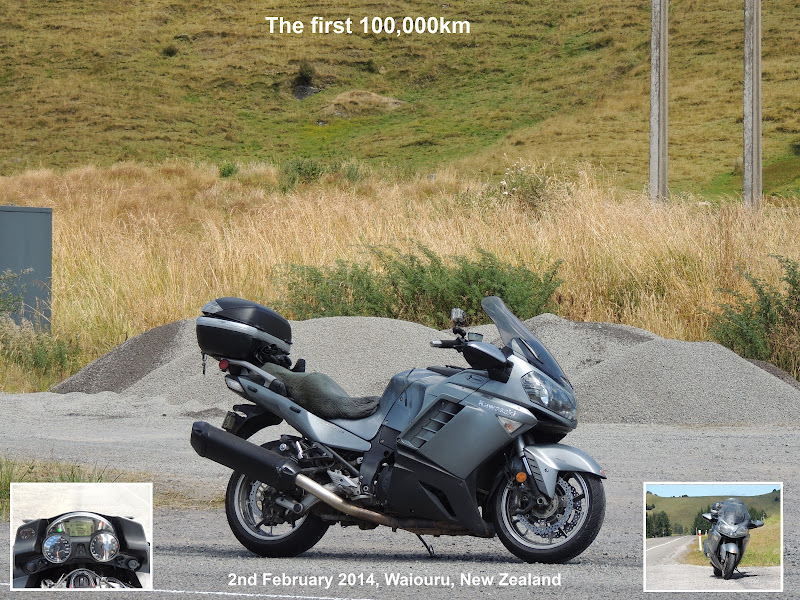 A quick stop at the top for a couple of photos and I was on my back down the Wairarapa side. Going down was a bit more interesting as it was quite windy and I got blown around a bit - more of an issue when you got hammered in a corner and blown off line a bit. Cruising through Featherston things started warming up a bit and by the time I stopped in Carterton for fuel I was quite hot and only to happy to loose a layer before continuing on. By now I was getting sick of riding in a straight line so in Masterton I turned off to take in just a bit of Route 52 to Alfredton. 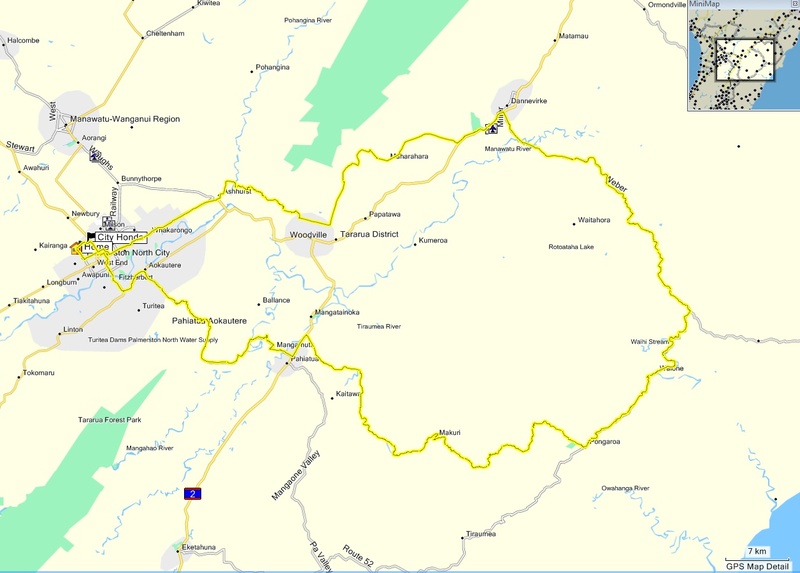 As usual it was a great ride through Route 52 - it's really great at this time of the year with the leaves changing colours etc. At Alfredton I turned off 52 (I thought I'd better go home at some stage) and carried on into Pahiatua before having a blast over the track and home. A great end to a great day's riding with about 380km passing underneath the Honda's wheels. A short article on the sole Connie rider in the Rusty Nut's Super Tour. Well done Barry! Yep, and about time too! I've missed my little red bike and I hope she forgives me for throwing her down the road. I promise to make it up to her by giving her a good fang as soon as possible and let her make some music through the brand spanking new mufflers! I've only ridden her around town so far but she seems fine and is definitely looking good. The LHS fairing was repaired and repainted along with the tank and the tank sports a new tank protector. As mentioned the mufflers are brand new and it's these which held up the repair process. They are slightly different than the old ones but are the latest from Two Bros and they still make the same music. Tomorrow Brian, Mark and I are planning to head down to Wellington for an ambulance run there so if the weather is fine then the little red beast will get her first decent outing in a long time. Can't wait! Slowly there's some stories coming in from the super keen Super Tour riders. There's a few pictures here on the Rusty site and The Xena Commander has his great write-up here. Great pic of all the finishers after the event. Ok, so I won't start this blog by going on about fine autumn day's. I'll just say that autumn is my favourite time of the year (especially for riding) - cool, clear and still weather. And that's enough of that - on with the ride. Supersonic had posted up that he was keen for a ride and was thinking of riding out Vinegar Hill etc. I mentioned that I'd done that the previous weekend and how's about going East? He was pretty keen on the idea and so we met up in town before heading for the track. We had a great ride over the track and the ride videos below show a few of the best sections of the track. From Pahiatua we rode through to Mangatainoka and turned off for the ride through to Pongaroa. This is a great bit of road but you definitely need to keep your wits about you as every turn can throw up a challenge - from stock on the road to unmarked roadworks and new seal. Our main hazard was the unmarked new seal and there were several nasty sections to get through. Check out the videos and you'll Sonic being a good chap and pointing out all the nasty bits. In Pongaroa we stopped for a late lunch and a spot of gas bagging before I led us off on Route 52 to Weber. Another great piece of road this, with corners a plenty and plenty of nice scenery. From Weber the road opens out a lot more to lots of fast flowing sweepers and it's real bikers delight all the way back into Danniverke. From Danniverke we ended up taking some back roads to Woodville before we attacked the Saddle. Getting close to Woodville we were passed by four quick trumpies - two of which missed the turn-off to the Saddle so they got to pass us again over the Saddle. One thing I haven't mentioned yet is the plethora of bugs that were out and about. By the time we began to tackle the Saddle my screen and visor were splattered big time (check out the pictures and video) and this combined with the low sun made for some pretty poor visibility going over the Saddle. It was still a great ride over the Saddle and I even managed to gobble up one of the triumph riders who didn't know how to go around corners before meeting back up with Sonic for the potter into town. A really great day out in the sunshine! More video from Sunday's ride. This time it's on the way home via Vinegar Hill. A fair bit of traffic on a Sunday afternoon so just a few highlights. Some of the video from yesterday's ride. These clips are taken travelling from Kimbolton to Rangiwahia and I've trimmed out some of the boring bits (not many). After my quiet pootle in the morning it seemed rude not to make the most of the still fantastic weather and so after twisting Mark's arm we headed out to do the Rangawahia-Mangaweka-Vinegar Hill loop. The ride was fantastic - the clear day offering great views in every direction. The only obstacles we had to deal with were loose metal, slow cars and a farmer moving some stock on the road. I had the video camera on for parts of the ride so I might upload a little bit of the video from the ride at some stage. I figured that seeing that it was Sunday morning there was no rush to go for the tag so I had breakfast first and then hit the road just before nine. Heading up the road I discovered that something wasn't right with the bike - it seemed to have no grunt and I was winding on the throttle with little response. The bike had been warmed up and sounded ok but it just wasn't pulling away as per usual - weird. I road on a little thinking that maybe she was still just a bit cold but no dice, still performing like a 250 when at low revs. I started wondering what was going on - was the rear brake dragging? Nope, all good there. Eventually I twigged - the glue holding the heated grips on to the throttle had let go and the grip was slipping when I wound the throttle on. After I'd worked this out it was a bit easier to manage but still a real pain - anyway back to the tag. When I got there I jumped on their computer only to discover that I'd been beaten to the tag by around 15 minutes - damn! Never mind, Jared had some loctite and some coffee so I got the bike sorted, had a bit of chat and then headed back out to make the most of the fantastic day. It's taken ages and I've nearly posted all my video from the TT. There is still some more but it gets a bit the same after a while - also there is some I'd better not post. So here's the last exciting one - boarding the ferry in Picton and saying goodbye to the South Island. This next video is on the road between the glaciers (Fox and Franz). This is a great piece of road with corners galore - I think there is at least 2 or 3 15km/h hairpins. Unfortunately, this time around there was quite major roadworks on both sides of the hill so I left the camera off until we got out of the rough stuff. This last video is the final couple of corners and the one lane bridge as you come into Franz Josef. A couple more videos from the Haast region. The first is further West from Thunder Creek and the second is finally coming out of the bush and arriving at Haast. This weekend marks the end of daylights season and so therefore tonight was the last of the Friday night rides. After meeting up at the usual place six of us finally decided on a quiet ride over the Saddle, through Balance and then back into town via the Pahiatua track. It was a good little ride with no issues apart from a low sun as we dropped down over the track on our way back into Palmy.